How did we let teacher burn-out happen, and what can we do about it – before it's too late? This brave and disruptive book accurately defines the problems of low teacher morale and offers systemic, future-proof and realistic solutions to bringing hope, energy and joy back to the profession. The simple answer is staring us in the face: increase teacher agency. Our rallying cry: our profession needs a return to values of humanity, pride, and professionalism. From research literacy to a collective voice, better CPD to smarter accountability, contributors to this book demonstrate the huge scope for increased teacher influence at every level of the education sector. Education voices including Sam Twiselton, Alison Peacock, David Weston and Andy Hargreaves, supported by a broad range of academics and policy makers, vouch for increased teacher agency and stronger, more powerful networks as a means of improving practice, combatting teacher disillusionment, and radically improving UK education. This text offers an exciting and hopeful perspective on education; urging teachers to work together to ‘flip the system’ and challenging policy makers to help… or get out of the way. Chapters have been contributed by Tom Bennett, Peter Ford, Jonathan Firth, David Weston, David Williams, Zeba Clarke, Julie Smith, Dr Robert Loe, Jeremy Pattle, Debra Kidd, Steven Watson, Ross Morrison McGill, George Gilchrist, Howard Stevenson, Professor Dame Alison Peacock, d’Reen Struthers, Phil Wood, Rae Snape, Simon Gibbs, Ross Hall, Jackie Ward, Simon Knight, David Frost, Sheila Ball, Sarah Lightfoot, Andy Hargreaves, Darren Macey, Gary Farrell, Julian Critchley, Tony Gallagher, Gareth Alcott, Sam Twiselton, Jelmer Evers, Alma Harris, Michelle Jones, Natalie Scott, Deborah M. Netolicky, Jon Andrews, Cameron Paterson, Per Kornhall, Joe Hallgarten, Tom Beresford and Sara Hjelm. 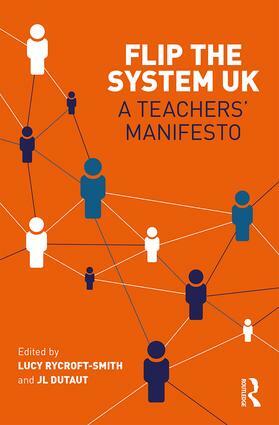 "Flip the System UK: A Teachers’ Manifesto is a book with many faces. It is a manifesto, a great overview of current discussions in education - both in the UK and abroad - and a wake up call to both teachers and policy-makers. Still it has [with] a common theme throughout the different chapters: a love for the profession of teaching. A love that is translated in questions about how we can do better as both an individual teacher and as a profession, how we can work together, how we can weigh in on policy, and so on. I appreciate the attempt of the book to rise above the discussions and polarization often found between teachers themselves. The authors do this by pointing out those common goals, this common love. Even if you don’t agree with every single contribution in this book, as a teacher you will recognize the common goal." Pedro de Bruckyere, Educational Scientist, Artevelde University, Belgium. "This timely book contains a wealth of detail about education policy, teacher professionalism, and ways to develop agency and collaboration within education. It contains a multitude of thoughts, ideas and opinions from well-known commentators, that will make you think more deeply about where we have come from as a profession, and where we might be going in the future." "This book is full of detailed analysis, informed opinion, and interesting insights into what has been happening in education over the last couple of decades. It will challenge your thinking and give you a greater depth of understanding about different perspectives on where the profession might helpfully go next. I particularly enjoyed reading the chapters written by Dame Alison Peacock and Dr Debra Kidd." Sue Cowley, educational author, trainer and presenter, UK. "There are few books on education you return to time and again…ones you keep handy for reference and renewal. Well here's one - a veritable potpourri of ideas and insights into what to do today, tomorrow, next month and next year to make our schools better. If the educational world's divided into energy creators and energy consumers, here is a treasure trove of ideas to tip the balance in favour of the former at a time when the latter, aided by successive governmental blunders, are in danger of destroying hope itself. And we all know what happens to people when they are without 'hope'. So keep this book by you and return to it time and again." Sir Tim Brighouse, British educationist and former Schools Commissioner for London, UK. "This timely book is exactly what is needed for the UK education sector in its current state. It is written by teachers, for teachers, [the book] speaks up about the need for fundamental change in how the profession is organised, taking it from being managed to being self-managing. Amongst the diversity of voices and essays are practical solutions for how teachers can get involved in the movement, alongside the theoretical background for why their involvement is necessary for the future of teaching. This book presents a powerful articulation of the problem, and a rousing call for a collective solution." Lucy Crehan, education explorer and international education consultant, UK. "This is an exciting and important book that brings together a wide range of people from across the world of education, all of whom are calling for the same thing: for teachers to take control of education in the UK. It very clearly shows where the problems are and in many cases, proposes clear solutions." "Flip The System UK: A Teachers' Manifesto, edited by Lucy Rycroft-Smith and Jean-Louis Dutaut, challenges current practice and urges educators to pull together to tackle the problems of low teacher morale. It offers systemic, future-proof and realistic solutions to bringing hope, energy and joy back to the profession." "The thread of empowerment is skillfully women throughout this book. It promotes the teacher as someone with commitment to getting it right in challenging circumstances. As a manifesto it is affirming… It would be useful for teacher educators (and leadership teams) and CPD/ quality managers in particular"
Lucy Rycroft-Smith is a maths teacher now working as a writer and researcher, who makes regular contributions to The Guardian and TES. JL Dutaut is a teacher of citizenship, media, and government and politics.